By listening to the needs expressed by the CHUM, the Fondation is able to respond to the immediate and urgent requirements of the patients. Every year, the CHUM presents the Fondation with a list of priorities that is established with the help and consultation of the heads of each department. Your donations therefore make a real difference for the patients. They provide the chance to benefit from the best possible care. Your generosity supports new and exciting quality projects. These are some examples of accomplishments made possible by your donations throughout the years! 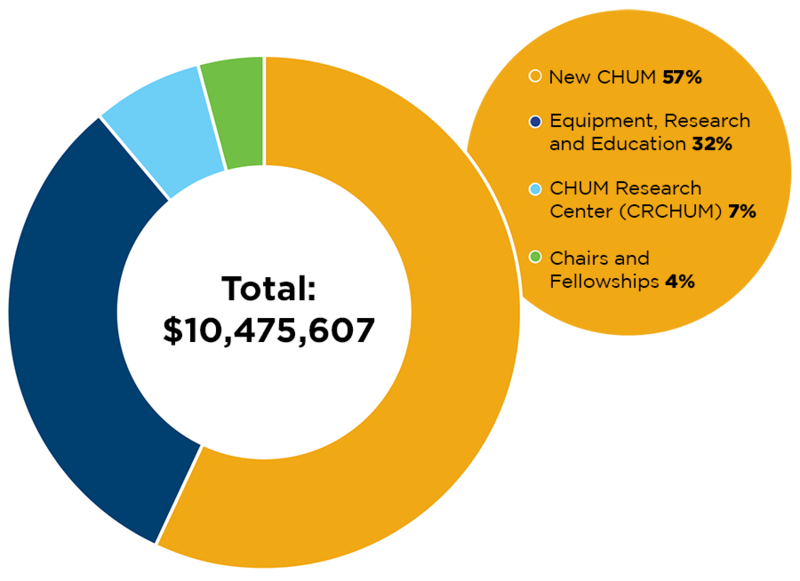 All donations are directed toward the acquisition of cutting-edge technology, research, education and the promotion of health, which means that donors are directly contributing to the wellbeing of the patients of the CHUM. The purchase of the 4th Generation da Vinci SI robot, which reinforces the CHUM’s position as a leader in healthcare services in Canada and internationally, was made possible by the hard work of Dr. Diane Provencher, Gynaecologic Oncologist and Researcher in Clinical Research, Dr. Fred Saad, Head of Urology Services and Medical Director of the Interdisciplinary Group in Urologic Oncology at the CHUM, and from successful collaboration with the Fondation. Primarily used in cases of prostate cancer in urological oncology and in cases of uterine cancer in gynaecologic oncology, this robot allows for minimally invasive, ultra-precise laparoscopic surgery. The benefits for patients include small incisions instead of large scars, significant reduction in postoperative pain, reduced blood loss, less blood transfusions and shorter hospital stays (often less than 24h). Alain Mailloux, diagnosed with prostate cancer at 42 years of age, one of the CHUM’s first patients to be operated with the da Vinci robot. The C-Arm imaging system is used during surgical procedures, particularly those involving cardiac, vascular, neurological and orthopaedic concerns. This C-shaped device, which allows for a wide flexibility in positioning, magnifies the image and requires an inferioir amount of X-rays than more traditional equipment. Patients and doctors of the CHUM are therefore exposed to less of these useful but potentially harmful rays. In 2011, the CHUM became the first facility in Canada to use GreenLight XPS 180 W laser technology. This device treats benign prostatic hyperplasia (BPH), with minimally invasive surgery. The benefits for patients are numerable. They include faster recovery, reduced postoperative complications and decreased inflammation and oedema. In February of the same year, 84 year old Mr. François Brault,, became the first patient to undergo an operation for BPH using this technology, performed by Dr. Kevin Zorn, Urologist and Head of Robotic Surgery at the CHUM. François Brault, first patient to be operated using GreenLight technology at the CHUM. The CHUM was the first hospital in Montreal to equip itself with a PET camera, a medical imaging system used for nuclear medicine. Thanks to a special fundraising campaign conducted by the Fondation, the CHUM benefits from this specialized equipment, which allows for earlier detection of tumours and better monitoring of patient treatments in oncology, cardiology and neurology. Marlène Boudreau, one of the CHUM’s first patients to benefit from the PET camera. The Fondation contributed toward the purchase of a magnetic resonance imaging system, which allows us to observe tissues and internal organs without emitting radiation. This device, used to identify heart problems or to dilate blood vessels, is useful for treating heart attacks, especially in emergency situations. The CHUM treats 75% of all patients who need an ultrasonography in gastroenterology in Quebec. The Pentax Camera provides high-resolution images of tumours, cysts or other abnormalities affecting the oesophagus, stomach, pancreas, biliary tract or colon, allowing for early diagnosis and effective intervention. The CHUM is the only hospital in the world to benefit from the advantages of this type of CT scanner in radiation oncology. This scanner is faster and offers more accurate and better quality results. Since the scanner combines the effectiveness of two appliances in one, thanks to its dual energy principle, it is highly productive, uses less radiation and provides better access to treatment. In 2001, the Fondation committed to providing financial support for research chairs and teaching at the University of Montreal until 2020. Since 2012, over $7M have been donated for the creation of 17 research chairs. This investment makes the Fondation one of the University’s biggest donors. These chairs are dedicated to research and education in a variety of disciplines that include orthopaedics, osteoarthritis, breast cancer, hepatology and family medicine. The Fondation also funds specific research projects, especially those concerned with liver diseases. Finally, every year, the Fondation donates a sum of 1,5 million dollars to the CHUM Research Centre (CRCHUM), in order to support its mission of clinical, basic, epidemiological and evaluative research. This amount also helps in the recruitment of senior researchers, which encourages promising young professionals to stay and succeed. The Fondation, in collaboration with the CHUM and the Council of Physicians, Dentists and Pharmacists (CPDP), invests nearly one million dollars in fellowships every year. These are given to the CHUM’s young professionals who wish to improve their training outside of Quebec or to foreign doctors and researchers who wish to hone their skills at the CHUM. Because it attracts some of the best doctors in the world, this competition helps the hospital shine. Moreover, this program fulfills the hospital’s mission to provide super-specialized healthcare services by encouraging the training of high-level specialists and by attracting doctors and keeping them at the CHUM. Every year, the Fondation du CHUM publishes an activity report as a way to show recognition for the efforts made by those who have contributed to the improvement of the care given to patients.